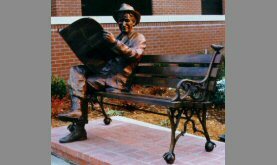 "The Spirit of Naval Aviation"
The idea was conceived by Robert R. Macon, Deputy Director of the National Museum of Naval Aviation in early 1993. Capt. 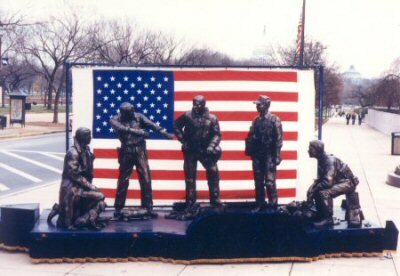 Robert L. Rasmussen, USN (Ret) Director of the National Museum of Naval Aviation designed the monument. 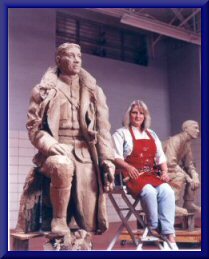 Renowned Oklahoma sculptor Sandra Van Zandt worked closely with museum and foundation officials to bring Rasmussen's design to life at the Smithsonian's National Air & Space Museum December 6 1994 unveiling in Washington, D.C. 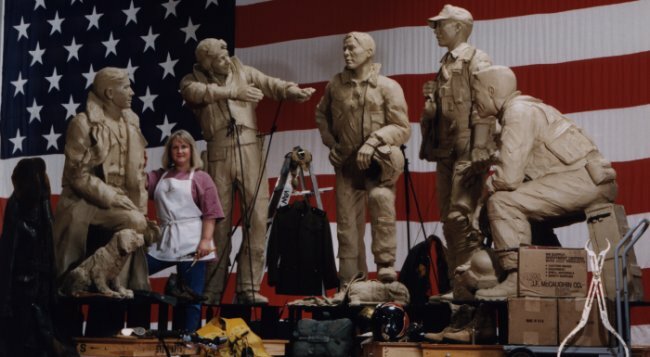 These five works of art, funded entirely by private donations, are so rich in artistic quality and emotional power that they could have been wrought through this rare combination of creative excellence, historic accuracy and firsthand experience. 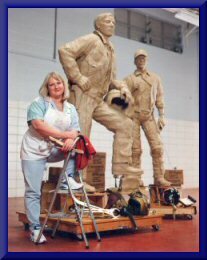 The monument will be dedicated at the National Museum of Naval Aviation in Pensacola, Florida, May 1996 and will serve as the centerpiece of the museum's new building. 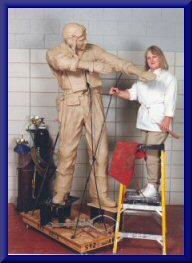 The National Museum of Naval Aviation is dedicated to preserving the history, honor, tradition and service for Navy, Marine Corps and Coast Guard Aviation. 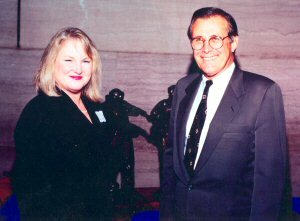 Donald Rumsfeld, the youngest Secretary of Defense under the Ford Administration and under the Bush Administration, sponsored the World War II Portion of the "Spirit on Naval Aviation Monument" in the name of his father, who was stationed on an aircraft carrier during WWII. Smithsonian Institution's National Air and Space Museum. After the unveiling the Monument was taken on a national tour which spanned 26 Air Shows and Air Space Museums over an eight month period. Naval Aviation transcends both time and space, from wood and fabric biplanes, to the frontiers of space. The Museum captures Naval Aviation's heritage and brings its story of challenge, ingenuity; and courage to you. 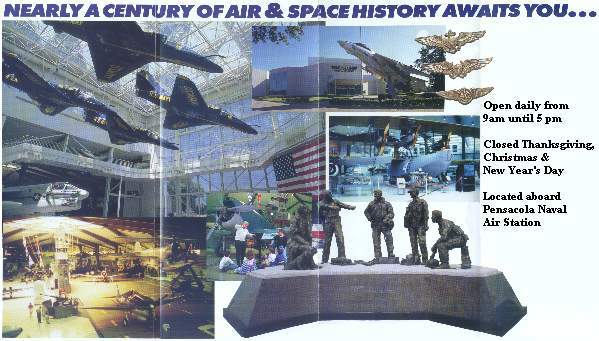 The National Museum of Naval Aviation is one of the largest and most beautiful air and space museums in the -id. Share in the excitement of Naval Aviations rich history. See over 130 beautifully restored aircraft representing Navy, Marine Corps, and Coast Guard Aviation. These historic and one-of-a-kind aircraft are displayed both inside the Museum's 291,000 square feet of exhibit space and outside on the Museum's 37 acre grounds. Enjoy our guided tours; soar with the Blue Angels in the dazzling seven-story glass and steel atrium that showcases four A-4 Skyhawks in a diving diamond formation. View them at eye-level from the mezzanine. he Museum also tells the human side of Naval Aviation and features memorabilia from each era of flight including personal mementos from historic battles, flight logs, vintage equipment, and flight clothing. The West Wing is devoted almost exclusively to World War II carrier aviation and showcases a full-size replica of USS Cabot's aircraft carrier island and flight deck. Famous World War 11 aircraft such as the Corsair, Avenger and Hellcat stand ready for take-off on the wooden flight deck, while other magnificent birds like the Wildcat, Dauntless and Kingfisher fly overhead. Kids of all ages love strapping into the, many cockpit trainers for pretend test flights or trying their hands at defending the ship from Cabot's anti-aircraft gun battery. And they can experience the thrill of flight in our 15-passenger full-motion flight Simulator. There's so much to see and do you'll want to stay all day! GROUP TOURS: By Appointment Only.